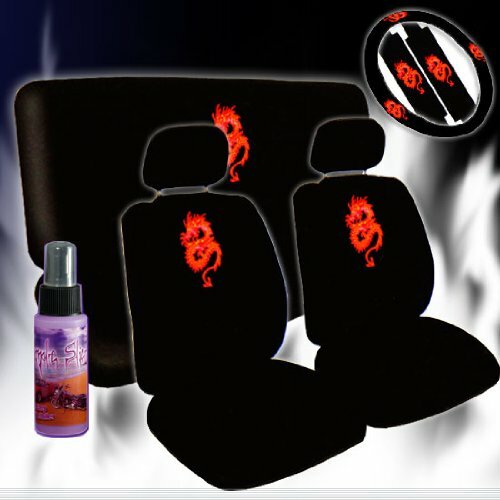 12 pieces complete car seat covers set with embossed red dragon logos. Made by superior polyester with stretchable ability to ensure snug fit for most cars with regular size low back bucket seats. This set includes 2 pieces rear seat covers (1 back, 1 bench), steering wheel cover (fits wheel from 14.5 to 15.5") and 2 seat belt covers to help to release tension build up by long time driving. Steering wheel cover was made with matching material with rubber inner. This set also bundles with a 2oz travel size ultimate multipurpose detailer and cleaner, the Purple Slice. It used by car detailers to make their job easy, just spray and wipe and see your car shines for up to 6 weeks. Purple Slice is not only great to be use on cars, it can also work on hundreds of other things. Try it on your LCD screen and be amaze with the cleanliness and non streak effect. RECOMMEND TO USE IT WITH "MICRO FIBER" TOWELS OR CLOTHS FOR THE BEST RESULTS.